The Glorious Kingdom: A Disciple's Guide to Kingdom Glory and Authority. JesusWalk Bible Study Series. 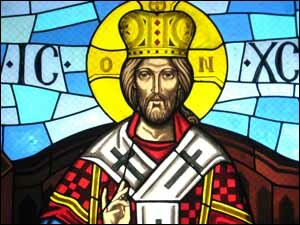 "Christ the King" (about 1985), stained glass at Our Lady of the Annunciation Melkite Greek-Catholic Cathedral in Roslindale neighborhood of Boston, MA. When you start probing the twin themes of glory and kingdom in Scripture and begin to connect the dots, the implications of glory and the Kingdom to the disciple are life-changing. That's the path on which I invite you to join me. This study of the Glorious Kingdom begins with Moses experience of God's glory at Mount Sinai and the building of the Tabernacle in the Wilderness, a portable dwelling of the King in the midst of his people Israel. Then we examine Jesus' relation to the glory and authority God's Kingdom from Daniel's prophecy of the Son of Man. Then to the Glorious Kingdom in Jesus' life and ministry, and including the glory of his death and resurrection. Next we consider how beholding God's glory changes us, and how we have authority in the Kingdom to rule and reign in our present life. Finally, we examine Christ's exalted glory at his return and the absolute glory of the Church, his Bride. All in all, this is a rich, 6-lesson study that will challenge you to rethink and reexamine your Bible. As I hummed and worshipped, meditated and theologized during the summer of 2016, I found myself longing to know and experience the Shekinah glory of Jesus in a new way. I've become convinced that this Glorious Kingdom is meant to both attract and engage us at the deepest levels of our spirits in the rule of the Kingdom in our spheres of influence. Suggestion: This study is not designed for new Christians, since it requires background that you probably don't have yet. If you're new in the faith, you'd do better to pursue my online study of the Gospel of Luke or the Gospel of John. Though if you want to try -- go ahead. I hope you'll join me on this journey closer to the heart of God. I encourage you to sign up for this study that will begin the Friday, January 27, 2016 and will last for 6 weeks. Sign up now so you don't forget -- and invite your friends to do the same. This is our 43th online Bible study since 1996. If you've participated in one before, you know how God can use them in your life. If not, then you have a treat in store for you. This is an cross-denominational study designed to help you grow as a disciple of Christ. -- Dr. Ralph F. Wilson. About the leader.